Blaze is great! She is very well behaved, smart and listens too. She dosen’t seem to be too big on toys at the moment, rather she perfers hand to paw play time. There have been no accidents in the house, she is eating and drinking plenty of water so hopefully she will put on some weight. 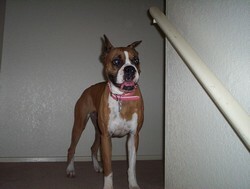 She has been quite good on the leash, and has been very friendly to every person and animal she has met. I haven’t heard her bark yet, even when we go on walks and dogs on the other side of the fence are going crazy. Blaze is very sweet.